Beautiful warm night tonight, which is fitting for the spring equinox, I suppose. I happened to take a visit to the vegetable garden tonight (I’ve been hard at work there lately, digging and planting) when I heard a commotion from the pond in our neighbour’s garden. Shining the torch, I could see that there were dozens of toads sitting on the damp grass and splashing in the water. It is obviously toad mating time again – there was no doubt what some of the toads were doing. I’ve seen toads mating here in previous years, but the sheer number this year made it quite a spectacle. For a species in decline it was good to see them obviously thriving here. Hats off to my neighbour for having such a good wildlife pond in his garden. Mrs BWM made the find of the evening when she came across a small newt on the edge of the pond. I’m not a newt expert by any means, so I’m not sure what species it is. I’ll look it up in the guidebooks when I get a chance. I remember reading somewhere that newts will eat frog- and toad-spawn, so perhaps it wasn’t as innocent as it looked. Haven’t come across toads this year, usually get the odd one frequenting the garden at some point. 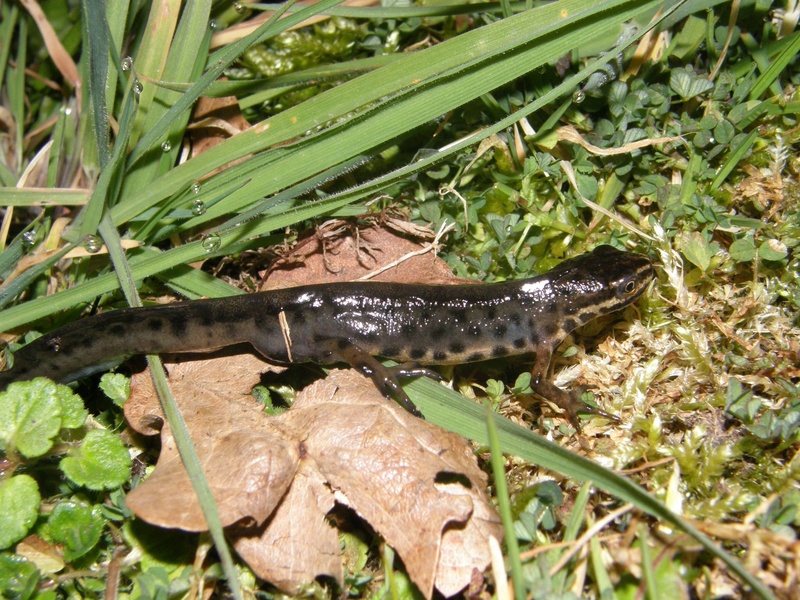 I’m not one hundred per cent but that could be a Palmate newt – did it have a tail filament? Had the same experience the other week in Herefordshire. Driving along country lane I had to walk slowly ahead of the car and literally pick up all the toads crossing the road to the pond and put them to one side. Quite a few of them were already getting quite intimate. As you say, for a species that’s getting rare I couldn’t believe it – there seemed to be hundreds of them. Very encouraging. Hi John – I was wondering if it was one of your rescue newts! It was a cute little chap anyway. I’m thinking it was a smooth newt, for reasons I’ll explain in a moment. The neighbours are back home now, so I need to be a bit careful about wandering around their garden with a torch in the dead of night, but I’ll see if I can find and photograph any more. Yes, it is encouraging. 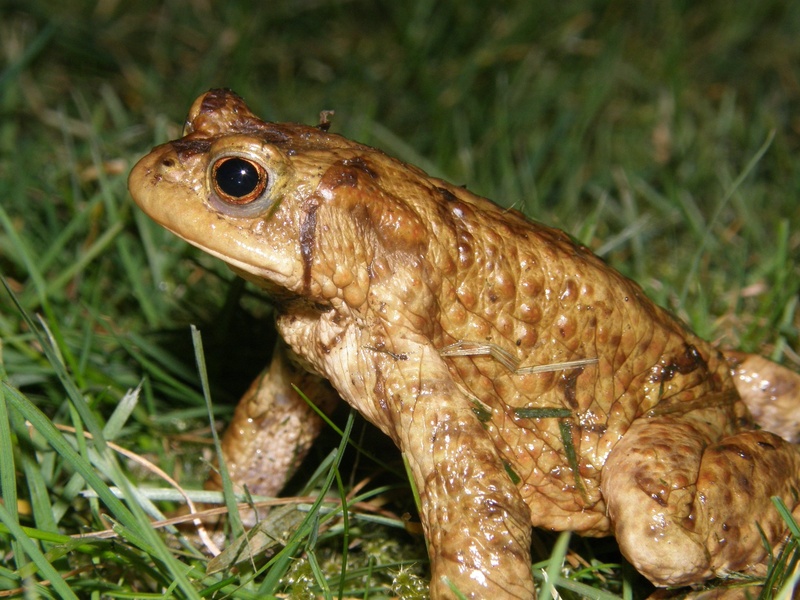 For the last couple of nights there’s been toads all over the garden, and like you I’ve been moving them off the drive and out of harm’s way. And yes, they were getting intimate. They were even getting intimate on my freshly planted vegetable garden! It’s a good sign for the future, and a good sign that even a small garden pond can make a difference to wildlife.